I started my comedy career the same way most do: I sat down with a blank piece of paper and tried to write “jokes.” I would spend hours staring at the paper, thinking about what was really funny. Suddenly nothing seemed funny. When I finally got some jokes on paper, they flopped when I performed them on stage. If you want to experience frequent and severe writer’s block as a comedian, sit down with a blank piece of paper and try to write something funny out of thin air. I had to come up with a better way to tackle the challenge of developing comedy material. That’s exactly what I did. And the results are in this guide. This chapter is made up of nine secrets to writing stand-up comedy material. I’m exposing them to you because they will help set your mental processes up for a much easier road when it comes to developing new stand-up comedy material. In some respects, writing could be considered the smallest part in the art of developing a stand-up comedy act. You are probably thinking, “How could the writing part of stand-up comedy be the smallest?” Let me explain why. It is documented that when giving a presentation or a speech to an audience, only about 7% of the message conveyed is in the words. I learned this repeatedly in my Navy training courses. Most of the message conveyed by the presenter is done with body language, voice inflection, and tone. Think about it. We’ve all sat through the boring, monotone, passionless lecture that put us right to the brink of a coma. The lecturer was merely a talking head trying to get through the material. The words he had to say just weren’t enough. But many comedians, especially new ones, depend solely on the words they have “written” to get the laughs they want. I know I did when I first started. I was a “talking head,” trying to say the funniest things I could craft on paper, instead of expressing my own views, opinions, and sense of humor the way I would normally with friends — with a combination of words, body language, facial expressions, voice inflection, etc. Let me be more blunt. If you depend on words alone to get the laughs you want on stage, you are probably in for a very long and painful haul. By relying solely on words, lines, sentences, structure, etc. to get the laughs you want, you would be focusing on 7% of the picture, excluding the other 93% you need to make those words work. You can write your little heart out day after day, trying to come up with the perfect combination of words on paper. But if you deliver those words without passion, feeling, and believability, all the hours you spent writing can essentially be a waste of time and effort while you continue to “pan for gold” trying to find the right words to say. Don’t believe me? Go on stage and see how your audience responds. This is the very reason I could make a classroom full of people laugh. I was interested and passionate about what I had to say, and I was not solely dependent on words to convey my message. I’m not telling you that the writing part of stand-up comedy is not important, because it is. Most of your work in stand-up comedy — especially in the beginning — tends to revolve around the writing process. However, I’m also saying that when the rubber meets the road, it’s the delivery and performance of your words that will ultimately give you maximum impact when it comes to making an audience laugh and laugh hard. Think of it this way: Every house has a foundation. While it is a very important and essential part of the house, it is a relatively small part of the house as a whole. It is much the same with developing comedy material for the stage. To me, stage comfort, delivery, and other aspects of performing far outweigh the part called “writing” in the big scheme of things. Your ability to capture an audience and cause them to laugh beyond their control transcends any mere words that you have to say. It is a combination of your words embedded in your delivery of them that ultimately makes the connection and creates the spark of laughter with an audience full of strangers. However, the majority of a comedian’s work lies in off stage development of comedy material — the writing part. Let me assure you, it can be a lot of work. So how do you avoid becoming a “talking head”? It’s easier than you think. Instead of trying to develop passion for some phony stuff written on paper that you think may be funny, you start by identifying things you are already passionate about. You let passion drive your writing instead of letting writing drive you nuts. It is difficult to capture who you really are on stage if you deliver jokes that have been contrived from thin air. They often lack the passion that audiences crave (not to mention that it is usually somewhat difficult to write funny ones without years of experience). Also, “jokes” often tend to lack a consistent, definable point of view. I believe that this issue of passion is a very important one. What do I mean by passion? Each of us reacts differently to different things. Things that don’t bother me may drive you up the wall. Events that I find absolutely astonishing may not hold any interest or value to you at all. When I speak of passion, I’m not talking about what happens in the bedroom. I’m talking about those things, events, and experiences that stir or generate some sort of genuine reaction within you. Passion is conveyed when you talk in the intensity, emotion, and conviction behind the words that you are saying. When you speak passionately, your whole being conveys the message. Let’s say you approach someone who is deeply religious and you say, “There is no God.” I can assure you, the conversation that follows will be drenched in passion. Some people tend to equate passion with anger. That’s fine, if it’s your style. Dennis Leary is, without a doubt, my favorite “angry” comedian. But let me say this: You don’t have to be angry on stage to exhibit passion. If you think you do, you are missing the boat here. Merely ranting and raving on stage can come across as mere complaining unless you have a point to make — one that the audience can relate to. Passion is the conviction with which you say what it is you need to say. Let me put it another way: You don’t necessarily have to be a great joke writer to be a great stand-up comedian. The last time you were making your friends or family laugh, what jokes did you do that were written down? Do you stage all your conversations? Did you use joke formulas to make your friends laugh? Did you know where all the punchlines were going to be when you started talking? • In stand-up comedy, you must be able to repeat what you have to say with the same passion over and over again. This is one reason why having passion initially for the topics you discuss is so important. If you are passionate about your topic, it will be much easier to maintain that freshness and passion for the audience, even if you have performed that same material hundreds of times — especially if the material kills the audience. • Given the proper techniques, you can improve your comedic expression of what you have to say deliberately and methodically, so that your material improves to the maximum extent as you continue to perform. This is not that hard of a proposition if you think of it this way: We all have stories that we tell to friends about things that happened to us in our lives. The stories get better each time we tell them. How come we don’t get tired of repeating the same story to different people? It’s because of our passion for the experience and the opportunity to entertain yet another unsuspecting victim. It’s really no different in stand-up comedy (except you get more laughs per minute). If you still don’t get it, let me point you to one of the masters of passion on the comedic stage — Bill Cosby. If you have ever watched one of his performances, you can tell that he talks about his childhood, marriage, children, career, etc. with great conviction. His material is not only believable, but he effectively draws the audience into his world as he sees it. He has great passion for what he has to say, and it is one of the keys to his effectiveness on stage. Passion has a substantial impact on your believability on stage. If your audience believes what you have to say (whether it’s completely true or absolutely bogus), your ability to move an audience to huge laughter goes up substantially. Unfortunately, most stand-up comedians end up spending much of their creative effort developing passion for the “jokes” they have written instead of starting with and then developing material that they are genuinely passionate about. I believe that developing passion for a group of jokes written out of thin air is a much harder path to take. I personally feel that this is a waste of valuable time in the process of creating stand-up comedy material. However, if you start with material that you are already passionate about and use the techniques and tools I show you to develop material around that passion, you’ll find that your act will be more natural, easier to remember and deliver, and more fun for you and your audience. Not only that, but you’ll be using your own unique sense of humor and point of view in the material you talk about, naturally — without trying to make up some kind of phony character in order to deliver your act with feeling and conviction. Let the passion about what you have to say to an audience be the basis for your comedic expression. Otherwise, you are just trying to say funny lines and words. In Chapter 3, I will show how to identify the things you are passionate about. We write differently than we talk. Read a passage of dialog from any book or magazine. Does it sound the way you would talk if you were saying it to your friends? Not hardly. We are conditioned from youth to write better and more precisely than we talk. The written word has a tendency to be more correct. Audiences couldn’t care less about your grammatical perfection. All they want to do is laugh. Here is a small example from my act. Yeah, I’ve lived in California for a little over 7 years now. It’s funny living in Southern California with an accent like this because people ask me the most stupidest questions. Roye, Steve. I Ain’t Making This S**t Up, Self Produced Stand-up CD, 2000. Looking at these lines, it should be quite apparent to you that they would not win any awards for proper grammar. But this is the way I really talk. I have lived in California for a little over 7 years now. It’s interesting living in Southern California with an accent like mine. The reason for this is that people ask me the most absurd questions. These lines look better for paper, but they’re just not right when I say them. They’re not me. So the first example is what ends up in my act, because that’s the way I talk. Watch a comedian on TV performing a routine. Does it sound like he is giving a speech? My point is that we speak differently when we talk. We speak in incomplete sentences, interject unnecessary words, and use “street” language and incorrect grammar. We don’t talk to our friends like we are giving a lecture. When you are telling a group of friends about how you made it to 40 and now it takes you 10 minutes to pee, I would bet money it doesn’t sound like a State of the Union address by the President. If you talk to your audience like you talk to your friends, you will immediately increase your likeability (in most cases) and your ability to connect with an audience more quickly. So when we get more into the actual writing mechanics, write things down on paper the way you would really say them, not the way you would write an article for a magazine. Your comfort and confidence on stage will increase when you know what you want to say and can verbalize it the way you would normally express yourself. You will experience fewer mistakes when your act is performed in the manner in which you usually speak. You will find it much easier to remember your material. Plus, audiences are very attracted to a comedian (or any presenter for that matter) who has confidence on stage. Anything you write on paper should reflect how you talk, not how you write. 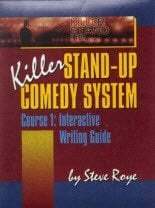 Most books about comedy writing appear to me to explore writing from the perspective of what is “funny” as it is written on the paper. They seem to make an implied, general assessment that if what you write is humorous, witty, intelligent, or clever on paper, then somehow it will translate to big laughs on the stage. While there is probably some truth to this assessment, I don’t fully subscribe to it. Just like we write differently than we talk, we also accept humor that we read differently than spoken humor. It has been my experience that audiences couldn’t care less about what is humorous, witty, intelligent, or clever. They want and expect hilarious from a comedian on stage. They want to laugh out loud, given the opportunity. To get that kind of response, the key lies in the application of the intensity, emotion, and conviction (passion) you have in what you are saying. As you are creating punchlines for your act, please keep in mind that whatever you write may not be that impressive on paper. That’s because it is difficult to capture the intensity, emotion, and convictions that will ultimately accompany those lines when you say them on stage. If you looked at my entire act on paper, you would soon wonder how I ever made a dime as a stand-up comedian. I have consistently made from $400 to $2000+ dollars an hour performing during my active stand-up career, and it wasn’t because I was a super crafty comedy writer. Here is the same example I used a few pages ago. This example illustrates my point once again. First of all, I don’t want you to think that this is all there is to the bit. This is just a tiny portion of it. There’s much more that I say about this topic on stage after these three sentences. What I want you to recognize is this: The first two sentences above are not intended to be funny; they’re the set-up. The third sentence is the punchline. Now, on paper, the punchline doesn’t really look that funny at all. But when I deliver it on stage, it always gets a laugh. Just listen to the clip if you don’t believe me. So why does this punchline get a laugh if it doesn’t look funny? Because it’s about more than just the words. It’s about how I say the words. It’s about what I’ve said and done before, leading up to that point. It’s about the way I look, stand, and express myself. It’s about other things that I can’t even put my finger on. It’s not the words that get the laugh; it’s me that gets the laugh. But conventional wisdom dictates that your material needs to look funny on paper. I believe that’s one reason why there is such a long history of a separation between comedy writers and comedy performers. For years, it was the norm for performers to buy “gags” from various writers. The jokes that ended up getting selected were purchased because they looked funny on paper. And at one time (many years ago), that system worked fine for a lot of performers. But times have changed, audiences have changed (thanks in large part to people such as Lenny Bruce, Bill Cosby, and George Carlin). Audiences expect more than just one artificial joke after another. They expect you to be hilarious, and they don’t care if your punchlines look good on paper. Aside from the example on the previous page, most of the parts of my act that I include in written form in this guide for illustrative purposes are carefully chosen. They represent the parts of my act that translate better on paper than other parts. But the hard, cold reality of the matter is this: A great deal of my act as spoken does not translate to hilarious on paper. I don’t let how something reads from a piece of paper dictate whether or not it will necessarily be funny on stage. I use paper to capture what I want to say. I use paper as an editing and structure tool far more than I do to “craft” the perfect punchline. Following is a another clip from an interview comedian Paul Reiser did with Byron Allen. In the interview, Reiser is talking about the process of writing his book Couplehood, as compared to writing comedy material that he performed on stage or for his sitcom Mad About You. So, a lot of times I can look at a joke on a page and say, “Well, it doesn’t read funny, but I know if we say it, it’ll be funny.” Here [referring to Couplehood], I don’t get to show up. I have to sort of try and find a way that makes it look on the page like I want it to sound. It’s interesting that Reiser was so used to writing for the ear, that it was an unusual experience for him to change gears and write something exclusively for the eye. Most new comedians struggle in the opposite direction. They’re so used to writing things that are only read that it’s foreign for them to then write material designed for a performance. This is not the easiest lesson to learn, but it’s vital that you do. Adding punchlines to a comedy routine can be like hitting a brick wall if you depend solely on how the punchlines look on paper. What happens is that, when you take those punchlines that look funny on paper and perform them on stage, many times the “funny” seems to mysteriously vanish from them. Then the internal struggle about “what is truly funny” begins. And it happens all because what you have written on paper reads funny, but you didn’t even consider whether if would be funny when you said it on stage. This is another mental trap I know very well. I lived it day and night for my first 9 months as a performer, writing and rewriting “jokes” until I just got disgusted with the whole process. I finally let it go. I came to a point where I just didn’t care if it was funny on the paper before I started. I started using the paper as the tool it was meant to be — a way to achieve brevity in what I really wanted to say, as opposed to letting words written on paper dictate whether or not I was funny. When I did this, the big laughs started to come. While there are some techniques that can be applied to help with the development of a punchline, there is no magic formula that works every time. Sometimes I think stand-up comedy is like weight loss. Everyone is looking for the “magic pill.” You know, the one pill you can take that allows you to eat tons of cheeseburgers and ice cream while you lay on the couch all day as the weight gain accumulated over years melts away. There is no such pill for weight loss, nor is there one for stand-up comedy. If wise old Benjamin Franklin knew and understood stand-up comedy, he would say the same thing, except he’s dead. Before you write a single word down on paper, I want you to get into the habit now of saying out loud what you want to say before you write it on paper. This will help you capture your thoughts, ideas, and comments the way they will be spoken, as opposed to capturing them the way you normally write. Stand-up comedy is about talking and expressing, remember? It is much easier to talk about something than it is to try to take a blank piece of paper and write the perfect joke. When I stopped worrying about how funny my material looked on paper, some strange things started to happen. I became more relaxed. I became more confident on stage. I got herpes (just kidding). Oddly enough, I started to become a better comedy writer. Stand-up comedy is really about talking, not writing. The techniques I will discuss in future chapters are presented from a perspective of how they would affect your punchlines as they would be said on stage and not how well they pass the “funny test” on paper. A tremendous amount of comedy is really about tragedy. I’m not talking about catastrophic, death and destruction kind of tragedy. I’m talking about poverty, poor career choices, failed relationships, missed opportunities, embarrassing moments, etc. I’m talking about personal tragedy, whether it is yours or someone else’s. Have you ever watched America’s Funniest Home Videos? That was a show packed with adults falling down, getting whacked in the head, or being put into socially embarrassing situations. Guess what? It was funny! Humor is the human way to cope with things that are less than appealing in our lives. I would bet that if you really wrote down topics that moved you emotionally and expanded on them honestly, there’s a lot of tragedy in there somewhere. Comedy really pokes fun at what is wrong in everyday life. So don’t be afraid to explore the tragedy in your topics, whether they are personal events or otherwise. But remember, tragedy only becomes funny when you are able to look at it or present it in a humorous way. Some “comedians” are absolutely passionate about what they say on stage. Many are passionate about a certain political view they have or about a particularly crappy relationship they’ve just gone through. But the problem with many of these comedians is that, while their passion about the topic is evident, there is no humor present at all. It’s just someone with a microphone doing a lot of bitching. She got my whole spiel about writing about things that move her, things that create emotion, passion, etc. I taught her the techniques in this book. She offered to pay me to rewrite her material; I accepted, provided it was in the format I taught her (and will teach you later). I also told her that I couldn’t guarantee how funny I could make it, mostly because I had no idea what angle she would come from or who she would be on stage. Still, she was thrilled that I would be willing to rework her raw material. About a week later, I arrived home and there was a package on my doorstep. In it were 11 pages of her material along with a note that said, “If you can get something funny out of this crap, you’re a miracle worker.” I began reading her stuff. It was about how she was trying to cope with severe co-dependency issues, how she still yearned for her ex-husband, and how truly lonely she was. I was on the brink of tears! It was probably some of the saddest, most heart-wrenching writing I had ever read. Mildly put, it was a real challenge to try to pull any humor out of the sheer misery she gave me to work with. I rewrote her stuff — almost in its entirety. Out of 11 full pages of text, I was able to salvage five lines — only one of which was funny. The rest was almost completely new and virtually unrelated to what she had written. Comedy is tragedy. However, tragedy all by itself is better suited for the funeral home, the attorney’s office, or the psychotherapist’s study than it is on the comedy stage. As I’ve already mentioned, I don’t just throw out one- or two-line “jokes” when I am on stage. I perform bits and chunks of material — many of which can be quite long by themselves. The longer you can stay on a topic, the better. There is a good reason for this. Once you have set up a topic and the audience is with you, the easier your job becomes. The longer you are on a topic, the less energy and fewer words are required to talk about the topic. Think about it. When you talk with a friend about something, do you explain every little detail every single time you open your mouth? Not hardly. Otherwise, we would have something to rival road rage. Once the topic of discussion has been established, we have the freedom to use fewer words to communicate our ideas because certain parts are already known and do not need to be repeated in order for the other person to understand what you are talking about. The same holds true in stand-up comedy. Once you have set up what you are going say, it takes less effort to get to the meat and various related subtopics. One of the big mistakes I see comedians make (I know this, because I did it too) is to provide unnecessary information for the set-up lines in a bit. There is a false assumption that the audience won’t get what you are saying and subsequently won’t get the funny part of what you have to say. Unfortunately, this leads to really long and unnecessary set-ups, which ultimately reduce your laughs per minute. Let me say this. Audiences are just as smart as you, if not more so. If you have initially set up your topic clearly and the audience knows what you are talking about, setting up the rest of what you have to say on the same topic can be done with minimal effort. You can talk about the topic just like you would with a friend, using minimal words to get your point across. I recommend that you try to stay on a topic for at least 3 minutes if you can. However, this is not a hard and fast rule. Don’t sacrifice funny in order to stretch a bit to 3 minutes. I have one topic that lasts for 20 minutes. My shortest topic is not quite 3 minutes. In a typical 45-minute set, I will only touch upon four to six major topics. I think you will find that if you apply the techniques I present in this guide, staying on a topic will not be the issue. The issue will be getting the stage time to talk about all the things you want. It has been my experience that the key to developing great comedy material is usually not in the initial writing, but in the rewriting and reworking of the material. Changing a single word can make the difference between a so-so bit and a great one. I tell you this before we begin because it is reality. It is the nature of becoming a great performer. Don’t be afraid to rework your material to make it great. Great material is a result of writing and rewriting, but you have to be disciplined about it, and you have to know how to make changes intelligently and effectively. In my Interactive Performing Guide, I explain and illustrate how to evaluate your performance effectively so that you can make the adjustments you need to enhance your act quickly. This guide is presented from a somewhat purist standpoint. I speak of stand-up comedy from the perspective that it’s you, a microphone, and your sense of humor. That’s really all you need. You don’t need to have any “special” talents (other than your natural ability to make people laugh) in order to be a really great comedian. If you do have certain other talents besides humor, you can definitely incorporate them into your comedy act. If you incorporate them well, they can definitely enhance your act. I have worked with some really great performers who were awesome singers, musicians, impressionists, magicians, etc. They were able to take their unique talents and apply them to the stand-up comedy that they performed. No matter what talents you may be blessed with, the philosophy and guidelines I provide in this guide still apply. You simply have the option of adding those talents to the mix for maximum impact. Comedian Michael Winslow made a career out of his ability to produce stunning sound effects with the microphone. My good friend and veteran comedian Denny Johnston uses a variety of props, as well as his ability to sing, play the guitar, and do killer impressions to make audiences laugh. Michael Finney combines his sense of humor with his awesome skill as a magician to make audiences laugh so hard it hurts. Now, I’m not about to try to teach you in this guide about adding music to your act, because I can’t sing. And I’m not about to try to teach you about using magic, because I can’t do that either without looking severely handicapped. If you have a special talent (whether it is music, magic, bull fighting, sticking pencils in your nose, or whatever), I’m going to assume that you have that talent down solid. I will not be teaching you in this guide how to do any of that stuff, especially sticking pencils in your nose. I will leave that learning process entirely up to you to figure out. However, I would like to take a couple of moments to say a few words about props, dialects, voices, and impressions. Using props in a comedy act falls outside the “purist” approach of simply communicating to an audience with a microphone. I don’t use props in my act, but I know several comedians who do. Since I know just a little bit about using props, I’ll tell you what I do know. Props can be anything that you bring on stage. They can also include things on the stage (the stool, the mic stand, the wall behind the performer, etc.). Props generally provide the punchline after the set-up. If you use props on stage, just make sure that the entire audience can see what you are displaying. Otherwise, you will limit the number of audience members who get the punchline. A good friend of mine has a suitcase full of props. He carefully packs the case in a way that allows him easy access to each prop as it will be used in his act. Like I said, I don’t use props in my act outside what may be on the stage when I get to the gig. I would recommend that you talk to and study those comedians who do use props to get a feel for the ins and outs of using them in your act. But just because other people use them doesn’t mean you need to. Audiences just love a great dialect, familiar celebrity voice, or impression. They can be a great way to add zip and appeal to your act. I’ve done a couple in my act over the years, but I mostly depend on my own internal impressions of people or events that I talk about. • They gotta be good and familiar. To work well, they generally need to be good and easily recognizable by the majority of the audience. With impressions, the more famous the person is that you are impersonating, the more readily the audience will recognize it. With dialects (British, Scottish, etc. ), they need to presented well enough for the audience to easily recognize which dialect you are doing. • They should reflect your sense of humor. When you build your act using these, just follow the same writing guidelines that I will give you in this guide. In essence, you would be merging your sense of humor with the mannerisms and gestures of the person you are imitating. • Celebrity voices and dialects alone are usually not funny. They normally must be woven into your own sense of humor and incorporated into a structured bit to work most effectively. • It is normally best to impersonate newer celebrities and personalities. Again, they should be widely recognizable — the more recognizable, the better. If you do a great Jack Benny or Clark Gable, you may be the only one who knows it. You will hear some comedians refer to the use of the more popular imitations (Arnold Swarzenegger, Ross Perot, etc.) as “old and tired” or even hacky. Don’t even believe it. If your comedy material is original, fresh (as reflected by your own unique sense of humor), and it works, go for it. Let the audience be the judge as to whether you should do it or not. Let me also say that there is no requirement to do any dialects or impressions in order to make an audience laugh hysterically. This last secret may actually be the most powerful one you learn. I’m not saying that you need to study Yoga, call the Psychic Friends Network, or go through some kind of shock therapy to develop successful comedy material. What I’m saying is that the things you feed into your brain and subconscious are extremely powerful. These things can either greatly help you or hurt you. If you think developing stand-up comedy material is difficult, then it will be. If you think that it will be easy, then it will be. The choice is yours. It’s the same amount of thinking, folks. Set yourself up for success. Tell yourself that what follows will be easy and you can do it! Having the right attitude is just as important as anything I have to tell you. I discuss this concept in much more detail in the performing guide because it is in the performing part of stand-up comedy where it is especially important to win the mind game. Okay, now let’s start down the road to developing some killer stand-up material.